Diesel is known and much appreciated by European motorists for great fuel economy, but gasoline engines are getting better and better, narrowing the gap between the two fuels. 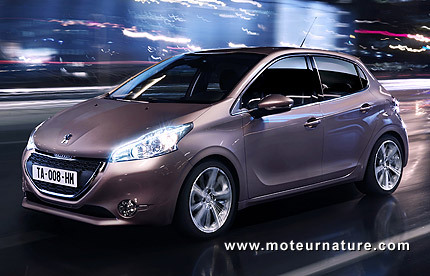 The latest Peugeot 208 is a prime example of these improvements. This new version of the 208 has been rated at 57 combined mpg in official tests. It’s true that the official testing method is flawed, it’s at least 10% off, but 50 mpg is still excellent for a 5-seater non hybrid car. It has a 1.2-liter 82-hp 3-cylinder engine but that doesn’t explain its exceptional fuel economy. What makes it so fuel-efficient is a smart Stop&Start system, along with the ETG5 gearbox, which is an automatized manual transmission. That unit doesn’t have any of the losses associated with a conventional automatic, but it has the auto-shifting abilities which enables it to always keep the engine in its most efficient operating range. The sad part is that gear changes on a robotized manual are always much rougher, and even jerkier, than an automatic with a torque converter to smooth shifts, but Peugeot thinks buyers will accept the inconvenience as it helps them save money at the pump.